When this trio released the album «Live at Belleville» in 2008 ( ECM records ), they were met with great enthusiasm from both the public and the press, Arild Andersen received the prize European Jazz musician of the Year 2008 by the “Academie du Jazz “ in France for the release. 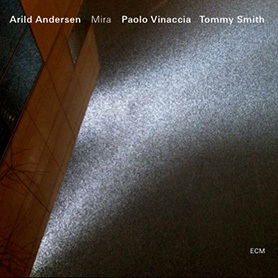 Arild Andersen is a well-known name in the jazz world. He is a legend in Norwegian and international jazz. Andersen is known for his collaboration with Jan Garbarek from the 1960’s, and this time he also played with musicians like Don Cherry, Sam Rivers and George Russell. In 1982 he started the legendary band “Masqualero “with Jon Christensen, Nils Petter Molvaer, Jon Balke and Tore Brunborg. The band existed for 10 years, releasing four albums and won three Norwegian Grammy Awards. From 1990 he has enjoyed as a musical center of gravity to combine Norwegian folk music with improvised music. He has worked with Bill Frisell, Stan Getz, Paul Bley , Ralph Towner , Nana Vasconcelos , John Scofield, Pat Metheny among others. Andersen was «Artist in Residence» at the Molde Jazzfestival 2005. From 2007 he has played and toured with the new trio with Scottish saxophonist Tommy Smith and Italian/Norwegian drummer Paolo Vinaccia. Jack de Johnette, Trilok Gurtu. Paolo Vinaccia has worked with Arild Andersen for many years in different projects. Born in Italy, he has lived 25 years in Norway and has been active in the Norwegian and European jazz scene and a central improviser with Nils Petter Molvaer, Ketil Bjornstad, Terje Rypdal, Bugge Wesseltoft, Palle Mikkelborg and others. Paolo Vinaccia was commissioned for the work «Landkjenning»to Canal Street Jazzfestival in 2006 with Terje Rypdal.